Hands-on Training that's Exciting and Fun! Want some one-on-one instruction to go over the basics, hone your shooting skills, or learn something new? At A & S, our NRA qualified instructors are looking forward to sharing their experience and enthusiasm with you! ½ Hour Sessions from beginner to advanced. At least we think so, and we hope you’ll agree. 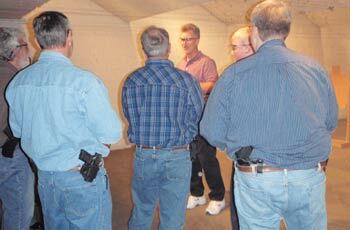 We offer popular NRA Firearms Training and Safety Classes featuring both classroom and hands-on training. This five hour class provides you with the basic knowledge, skills, and attitudes necessary for owning and operating a pistol safely. The Saturday class is one 5 hour session. The Tuesday/Thursday class is two 2 ½ hour sessions. Course Prerequisite: No previous shooting experience required. This course is designed for first time and beginner shooters. However, the lessons taught serve as an excellent refresher course for the more experienced shooter. This class will include both classroom and live shooting instruction. All materials, firearms, ammunition, and safety apparel are included. With the completion of this course, receive a FREE one-month Range membership (a $35.00 value). This FREE membership must be activated within six months of completing this class. See our Class Policies. Visit our Class Schedules page for days and times. Excellent course. Informative. Answers all questions. We Learned. Loved being able to shoot different guns. ability to handle any handgun safely. A & S to take this class. This eight hour class is a hands-on program encompassing both classroom and range instruction. Class begins at 8:00 am and ends at 5:00 pm with one hour for lunch. Your NRA qualified instructor covers equipment, techniques, tactics, and potential implications of armed self defense. This class will include both classroom and live shooting instruction. 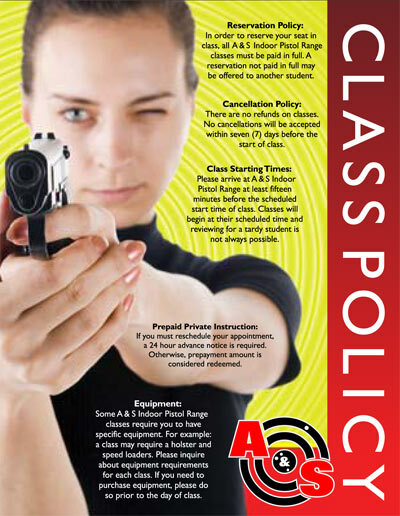 All manuals, classroom materials, and range time are included in the class. See our Class Policies. Visit our Class Schedules page for dates and times. out prior to this class. Thank you. One word to describe this course…Awesome! This three hour class will provide you with the knowledge, skills, and attitudes necessary to safely carry and defensively shoot a pistol. Class begins at 6:00 pm and ends at 9:00 pm. 1. Basic Pistol Shooting Class required. 2. Must be proficient in safe gun handling skills with YOUR own firearm. Fundamentals: Grip, stance, trigger control, flash sight picture, drawing and re-holstering, strong hand and weak hand shooting, fast accurate first shot, controlled accurate rapid fire, speed vs. tactical, reloading, drills for fun and practice. Equipment Selection: Guns, holsters, belts, magazine pouches, speed loader holders, and modifications. The course will start with approximately 2 hours of classroom time, plus 1 hour in the Range with live fire training. Excellent course! I would highly recommend.